How would one know if the code one has created is easily readable, understandable, and maintainable? Of course from the author's point of view, the code is readable and maintainable, because the author wrote it and edited it, to begin with. However, there must be an objective and quantifiable standard by which our profession can measure code. It is possible to read the code and understand at a basic level the flow of logic. It is possible to understand at a deeper level what the code is doing to include inputs, outputs, and algorithms. Other developers can make meaningful changes to the original code such as bug fixes or refactoring. One can write new code such as a class or module that leverages the original code. 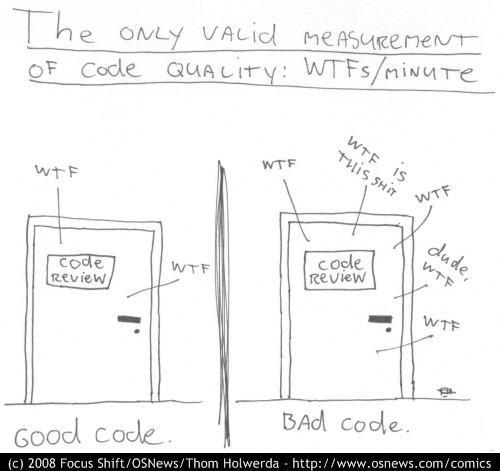 How do we quantify or measure code quality so that we know it readable, understandable, and maintainable? Your peer tells you after reviewing the code. You cannot determine this yourself because as the author, you know more than the code says by itself. A computer cannot tell you, for the same reasons that it cannot tell if a painting is art or not. Hence, you need another human - capable of maintaining the software - to look at what you have written and give his or her opinion. The formal name of said process is peer review. Sometimes, the best way to know, is to come back to code you wrote six months ago and try and understand what it was written to do. If you understand it quickly - it's readable. maintainable if you can maintain it. The real test for 1. is (as Alex in Paris and quant_dev say) that you can pick it back up after a few months doing something else. The test for 2. and 3. is that someone else can pick it up, and figure out how to extend or fix your code while following the grain of your design. If they can't understand the design, how it relates to the problem space, or how your code is intended to be used, they'll hack a solution across the grain instead. There are rules of thumb, principles (ie, rules of thumb someone wrote up nicely and gave a name) and all sorts of suggestions that may lead you in the right direction, or away from common pitfalls. None of them will guarantee the qualities you're asking for, though. If your code follows the principles of SOLID and DRY and has a good set of unit tests around it, it is probably maintainable. Is it readable? Read it. Do method and variable names make sense? Can you follow program logic without a problem? If the answer is yes, then the code is readable. Reading How To Write Unmaintainable Code - Ensure a job for life by Roedy Green, laughing, and learning. The essay gives you numerous examples of how to write bad code, using plenty of funny examples. It continues to explain how to utilize Creative Miss-spelling, Reuse of Names, the highly appreciated technique of Reuse of Global Names as Private. In a humorous way the essay teaches you how to avoid all of the examples of unreadable and unmaintainable code. Despite how it seems, there are some fairly objective measures you can consider. Books like C++ Coding Standards, Refactoring, and Clean Code have long lists of criteria to judge your code by, looking at things like meaningful names, function sizes, principles like coupling and cohesion, object design, unit testing, successive refinement, etc. The list is too large to be amenable to a checklist, but you read the book and pick out a few key things to work on, then after several months read it again to improve further. The proof is in the pudding. Watch what happens after handing it off to a reasonably competent person. If they don't need to ask many questions relative to the difficulty of the code, you've done a good job. This was an early lesson in my career. A mentor said, "Document everything, so that you can escape the program later on. If you don't anticipate questions when the answers are fresh in your mind, you'll have to figure them out when they're not." I read through all the answers, and I noticed nobody mentioned code complexity. There's a tight correlation between code complexity and readability/maintainability. There are numerous code complexity scoring algorithms, but I'll just talk about how McCabe complexity scoring works. Basically, McCabe scoring reads through your code and computes the number of unique "paths" there are through it. If you use McCabe as your numerator and lines of code as your denominator, you get a pretty good approximation of "readability" as well. If you've got 10 lines of code, and there are 300 paths through that code, that is some pretty unmaintainable code (difficult to change safely and easily), and it's probably not very readable. Conversely, if you've got 300 lines of code, but there is only 1 path through it (it has no conditions), it's both readable and easily maintainable. Where McCabe falls down however is in that latter example. If I've got 300 lines of code with no conditions, there's a really good chance I've done "copy/paste reuse", and obviously that's not a good thing either. So there are system-wide metrics that you apply in addition to McCabe -- like duplicate or near-duplicate code detection. I highly recommend reading, The Pragmatic Programmer. Turn off the IDE. Can you still read your own code? When there's a bug is it fairly easy to trace through it by hand and figure out what class you'll need a breakpoint in to figure out that's where the problem is? Or when you do use the IDE do you just not even bother and just step through from the very beginning? Does debug often becomes a game of wack-a-mole where fixing one bug creates 2+ more. From trigger pull to something useful actually happening, how many method calls does it take? How many methods pass the exact same or most of the same exact parameters on to another method call? How many files do you have to open to just add a simple new method to a class? Think on patterns and practices you've adopted. Did you do it because they made perfect sense or because somebody convinced you that "it's the only way to do it?" or because you wanted it on your resume or because some rockstar dev said so. How would one know if the code he created is easily maintainable and readable? Objects, methods and/or functions always do one thing. Methods and/or functions are concise (as in "brief but comprehensive"). Objects, methods and/or functions do essentially what you think they are supposed to do based on their names. Code that is destined for re-use is actually re-usable. Last but not least, if you can immediately unit-test the code, you have likely written single-responsibility, modular code at the very least. How would we know if we've written pretty messy and unmaintanable code? Are there any constructs or guidelines to know if we developed messy software? If you are reading through a method and it isn't apparent what the intent was, this is inelegant at best and likely unmaintainable at worst. If it doesn't seem simple, it probably isn't simple and that is a sign of unmaintainable code or code that will soon become unmaintainable. If there is a lack of symmetry (consistency) across the codebase, you are likely looking at unmaintainable code. In a single word, Experience. To start, you need to have put in the ground work, so I can't recommend more highly that programmers should take the time to read books such as Refactoring, which will provide some of the more essential tools in a programmers arsenal that will improve your ability to maintain code, and Clean Code which has been written by some of the most highly recognizable talents in our field, and which describes nearly everything you need to understand in order to ensure your code is clean and readable. No amount of reading however is a substitute for hard-earned experience. You really need to have worked with code for a while in order to fully appreciate the difference that attention to code quality can make. Through experiencing the pleasure of working with clean, well factored code, as well as the pain of working with code spaghetti, you learn to better understand what the authors of these books were really trying to teach you, but you do so in the wider context of real live production code, where the quality of what you do really matters, and impacts your ability to work easily with your code on a daily basis. It also helps to have either a good mentor, or a peer with the experience to confirm that you are putting the effort into writing code to a high standard. This is just one reason why code reviews can be so useful. Using code checking and formatting tools can also be a very useful aid to ensure that you are keeping things clean. Nothing however compares to experience earned through years of writing software, such that you automatically find yourself writing code that is clean, readable, and structured simply for ease of maintenance, and all because you've made it a habit to apply best practices for so long. It is exceedingly easy to read. It forces each node to have single, focused intent lending to clarity of purpose. And because each discrete task is isolated popping out, plugging in, and rearranging nodes (operations) to different ends is trivial. This lends to ease of maintenance. This boils down to 'clarity'. i.e How many questions does the programmer have to ask of a particular segment of code before they are sure that they 'understand what it does well enough' to achieve the current task in hand without causing unexpected side-effects. The book 'Code Complete, by Steve McConnell' goes into this in great detail. He goes through various metrics that you can use determine if code is of good quality. A function that causes 3 changes to states outside of its own scope is much more difficult to reason about and maintain than one just which just inputs something and outputs something else. You can't just know what the function does, you have to remember what it did and how that effects all other relevant functions. For OOP minimizing side effects also means classes with fewer members, and especially fewer members that can modify the class's state, since member functions can modify states beyond their own and have side effects (they can manipulate the class's internals, e.g.). It also means classes with fewer data members of their own so that there's less state for those methods to tamper with and fewer side effects they can cause. As a simple example, imagine trying to design a fancy data structure which can maintain a sorted state which it uses to determine whether to perform binary or linear searches. In such a case, it might be useful to separate the design into two classes. Calling sorted on the unsorted class might then return a data structure of another class which always keeps its contents sorted. Now you have less side effects (therefore less error-prone and easier to comprehend code) as well as more widely applicable code (the former design would be wasteful both in processing and human intellectual efficiency for small arrays that never need to be sorted). You might be able to implement the most terse code imaginable with maximum code reuse by using 13 different libraries to accomplish a relatively simple task. However, that transfers intellectual overhead to your readers by then having to make them understand at least parts of 13 different libraries. This inherent complexity should be immediately appreciated by anyone who tried to build and comprehend a third party library which required pulling in and building a dozen other libraries to function. This is probably a very controversial view but I would prefer some modest code duplication to the opposite extreme provided the end result is well-tested (nothing worse than untested faulty code duplicated many times over). If the choice is between 3-lines of duplicated code to compute a vector cross product or pulling in an epic math library just to shave off 3 lines of code, I'd suggest the former unless your entire team is on board with this math library, at which point you might still consider just writing 3 lines of code instead of 1 if it's trivial enough in exchange for the decoupling benefits. Code reuse is a balancing act. Reuse too much and you transfer intellectual complexity in a one-to-many kind of way, as in those 3 lines of simple code you saved above comes at the cost of requiring the readers and maintainers to understand far more information than 3 lines of code. It also makes your code less stable, since if the math library changes, so too might your code. Reuse too little and you also multiply the intellectual overhead and your code ceases to benefit from central improvements, so it's a balancing act, but the idea that it's a balancing act is worth mentioning since trying to stamp out every little form of modest duplication can lead to a result that's as difficult to maintain, if not more, than the opposite extreme. This is a given but if your code doesn't handle all input cases and misses some edge cases, then how can you expect others to maintain code you wrote that you didn't even get right before it transferred to their eyes and hands? It's difficult enough to make changes to code that works perfectly let alone code which was never quite right in the first place. On top of that, code that passes thorough tests is generally going to find fewer reasons to change. That relates to stability which is even more of a holy grail to achieve than maintainability, since stable code that never needs to be changed incurs no maintenance cost. Prioritize "what things do" over "how things do them" if you can't devote equal time to documenting both. A clear interface that is obvious in its intentions about what it will do (or at the very least, what it's supposed to do) in all possible input cases will yield a clarity of context to its own implementation which will guide in understanding not only how to use the code, but also how it works. Meanwhile code that lacks these qualities where people don't even know what it's supposed to do is SOL no matter how well-documented its implementation details are. A 20-page manual on how source code is implemented is worthless to people who can't even figure out exactly how it's supposed to be used in the first place and what it's even supposed to do in all possible scenarios. For the implementation side, prioritize documenting what you do differently from everyone else. As an example, Intel has a bounding volume hierarchy for their raytracing kernels. Since I work in this field, I can recognize the bulk of what their code is doing at a glance without sifting through documentation. However, they do something unique which is the idea of traversing the BVH and performing intersections in parallel using ray packets. That's where I want them to prioritize their documentation because those parts of the code are exotic and unusual from most historical BVH implementations. This part's very subjective. I don't really care that much about readability of a kind that's close to human thought processes. The most well-documented code describing things at the highest level is still difficult for me to follow if the author uses bizarre and convoluted thought processes to solve a problem. Meanwhile terse code using 2 or 3 character names can often be easier for me to understand if the logic is very straightforward. I guess you could peer review and see what other people prefer. I'm mostly interested in maintainability and, even more importantly, stability. Code that finds no reasons to change is one that has zero maintenance costs. I would say one way to know would be if new team members can pick up the code, understand it, and modify it to fix defects / meet new requirements with relative ease. Show the code to one of your peer programmers and have them explain to you what it does. Watch for these things. 1) If they can't easily explain the purpose of a block of code refactor it. 2) If they have to jump to another section of code to understand the current section, refactor it. 4) Anytime you feel an urge to speak during the process, that section of code needs refactoring. (The code isn't speaking for itself). Make all of your dependencies explicit. Cross-project libraries: senior devs, full back of tricks code/idiom/techniques Project specific libraries and system backend: medior developers, avoid most advanced and hard to explain stuff. Seniors will go trough this code looking for DRY improvement opportunities. Front-end: junior devs, use a strict style guide and set of techniques language constructs and idioms to avoid. Medior devs will go trough this code looking for DRY opportunities and hidden business logic. Layer your code by developer skill level and write maintainable code accordingly. Its never too easy trying to write readable and easily maintainable code, but its not to hard to write an easy & maintainable code. Not the answer you're looking for? Browse other questions tagged code-quality code-reviews readability maintainability or ask your own question. What characteristics or features make code maintainable? How clean should new code be? Are there any easy-to-follow/reliable methods for simplifying code? What exactly makes code “clean”? Maximum nesting for loops and conditionals? How to document and teach others “optimized beyond recognition” computationally intensive code? How to keep my Activity code readable and maintainable? How to quantify the (unit-)testability of a piece of code?